JERUSALEM (CNN) -- A Palestinian man went on a rampage Tuesday in downtown Jerusalem, ramming a construction vehicle into cars and buses before he was shot and killed near the hotel where Sen. Barack Obama is scheduled to stay Tuesday night. 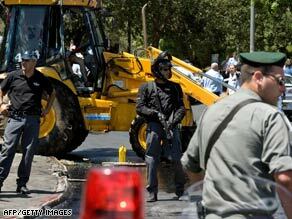 Israeli security forces secure the site of a backhoe attack Tuesday in downtown Jerusalem. It was the second such attack there this month. One person was "moderately to seriously wounded," and four others sustained minor injuries, according to an Israeli government statement, citing Jerusalem's police chief. Twenty people were treated for shock. The attack came three weeks after a Palestinian construction worker drove his front-end loader over several vehicles in Jerusalem, killing three people before he was shot and killed. The Israeli government immediately labeled the incident a terrorist attack. President Bush condemned the attack through a spokeswoman and called on others to do the same. "If it turns out that it was terrorism, all parties must condemn it," White House spokeswoman Dana Perino said. "Terrorist attacks do nothing to further the goals of Israel and Palestine living side by side in peace, a goal the president has been advocating for, and that both of those countries' leaders have been working toward." On July 2, a Palestinian construction worker, also from East Jerusalem, rammed a large front-end loader into a string of vehicles along Jerusalem's Jaffa Street. He killed three people before Israeli police shot him to death. The No. 13 bus also was hit in that attack. The construction vehicle hit and overturned the bus, which the driver said was full of passengers. Obama was scheduled to stay at a hotel near the site of Tuesday's attack. Speaking in Jordan, where he arrived for a brief visit Tuesday, the presumptive Democratic presidential nominee condemned the attack, saying it was "a reminder of what Israelis have courageously lived with on a daily basis for far too long." "I strongly condemn this attack and will always support Israel in confronting terrorism and pursuing lasting peace and security," Obama said. "Right now, my thoughts and prayers go out to all who were injured and their families." Security has been tight in Jerusalem ahead of Obama's visit and during a trip by British Prime Minister Gordon Brown, who left the region Monday. Brown also stayed at a hotel near the site of Tuesday's attack.